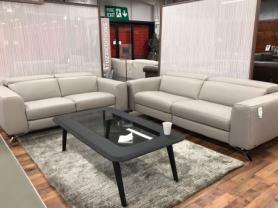 Natuzzi private label power reclining corner sofa in soft grey Italian protecta leather. The sofa is a far superior model with independent adjustable electric headrest and also electric footrest. High back for that extra support with an electric recliner makes it a must have. Also quite a compact size which would fit in most of the rooms. Also available with corner is a matching swivel push back recliner Natuzzi Genny chair. Genny is a very comfortable smart looking chair which goes well with this combination. The sofa measures 260cm x 230cm. Depth is 95cm.